We have continued our successful collaborative partnership with ZMMA Architects by working with them on two unusual and prestigious museum projects. The first of these was for the recently renovated Watts Studios in the Watts home Limnerslease, part of the artist village at Compton under the banner of the Watts Gallery which was built by and displays the work of influential Victorian artist G. F. Watts. 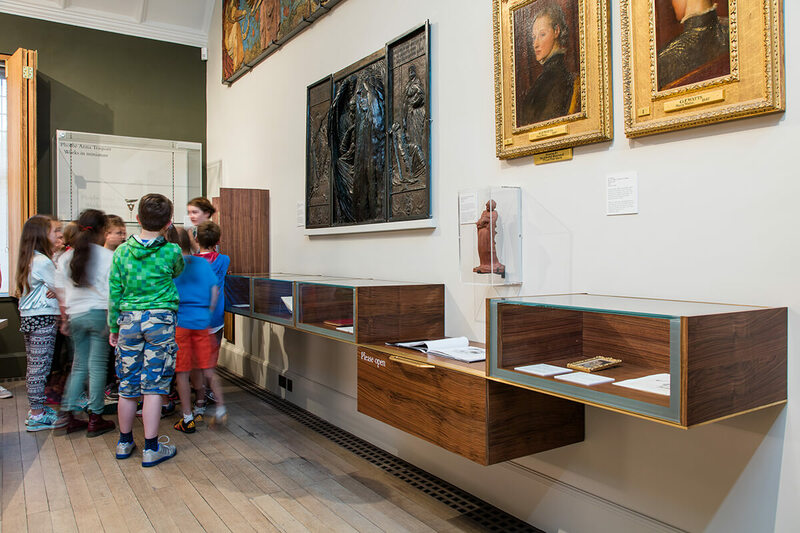 We were asked by ZMMA to build a vitrine for the Compton Gallery and a long wall mounted side-board style cabinet for the Mary Watts Gallery. Both these substantial pieces were of English Walnut with brass and glass fittings. The more straightforward piece was the side-board which demanded the more traditional cabinet-making skills. 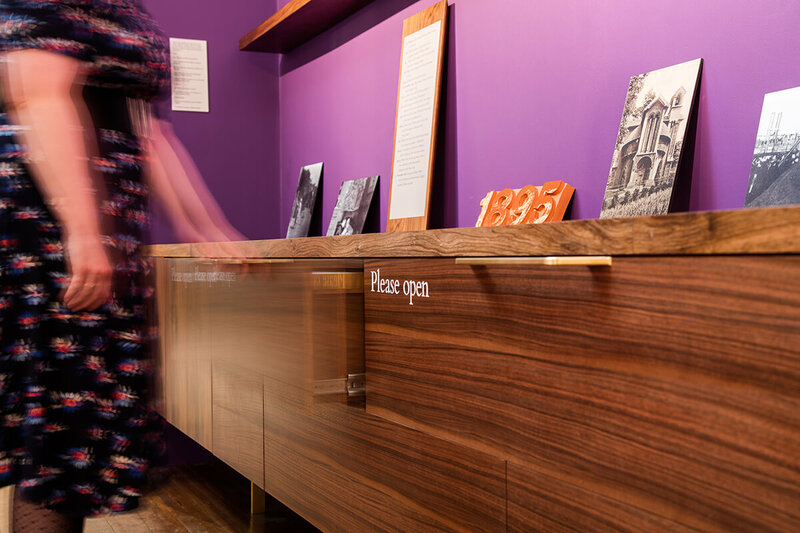 It incorporated lockable drawer storage as well as ‘discovery drawers’ for visitors to the gallery to open and explore the treasures housed within. 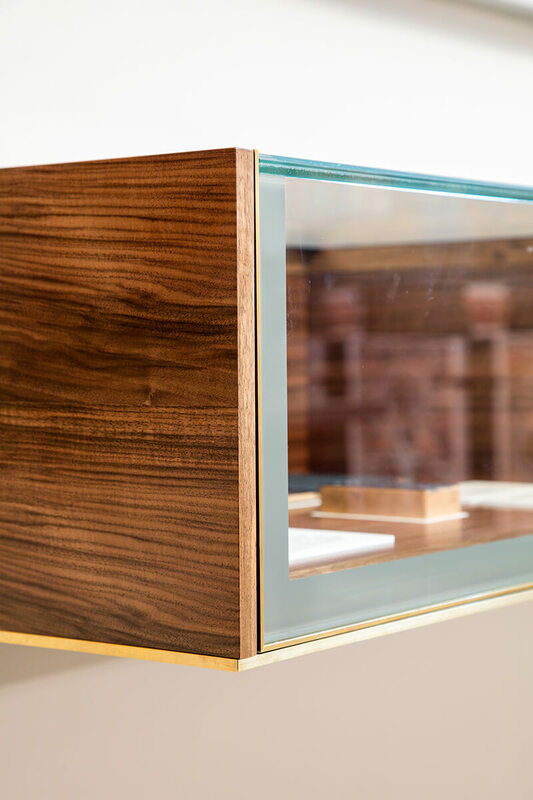 These drawers are also a feature of the vitrine (a glass topped cabinet for displaying objets d’art) though this was a particular challenge because not only was it comprised of a series of glass topped and fronted cabinets, it also needed a dropped section in the middle. 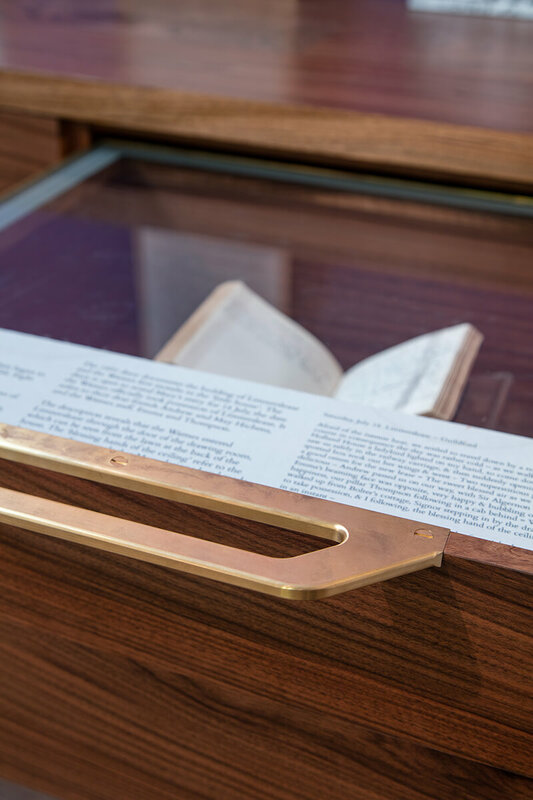 Brass detailing along the entire length of the cabinet complicated the construction further and this combination of timber, glass and brass elements led to a few headaches in the planning stages, and a few more during construction! However, it is the challenges that such projects present which makes them all the more satisfying and we like to think that our dedication and attention to detail contributed a little to the Watts Gallery being listed in ‘The Times’ list of The Top 25 Small Museums. The second museum project we worked on with ZMMA was the world renowned V&A Museum in London. ZMMA had won the contract for the restructuring of the 1600 – 1815 gallery and as part of this needed to create an education suite. They chose us to make the stools they had designed for the use of children visiting the gallery. 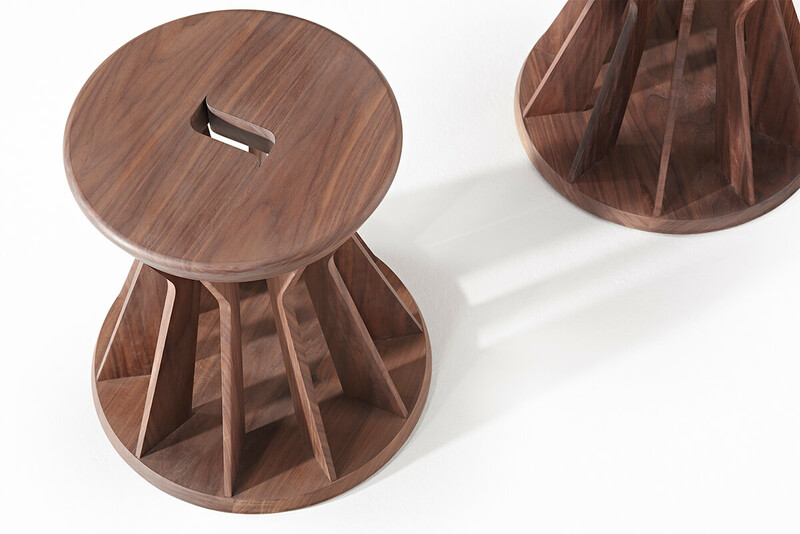 The stools were made from American walnut which was then finished with a grey-tinted lacquer. The challenge in the construction of these stools was to maintain the delicate fluted sides whilst retaining structural integrity and preventing them from twisting a skewing when sat on. 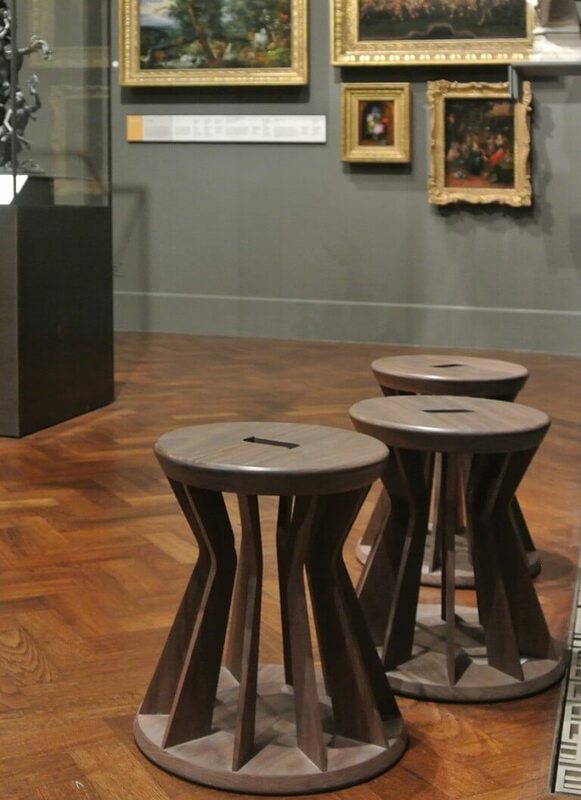 After a lot of head-scratching and experimentation, a solution was devised and seven of these pretty little stools are now supporting the bottoms of children exploring the V&A each day! To find out more about ZMMA Architects click here to visit the website. For information about the Watts Gallery, Limnerslease and Watts Studio click here. The V&A website is obviously as expansive as the museum itself so this link takes you specifically to the V&A Europe 1600-1815 Galleries pages.